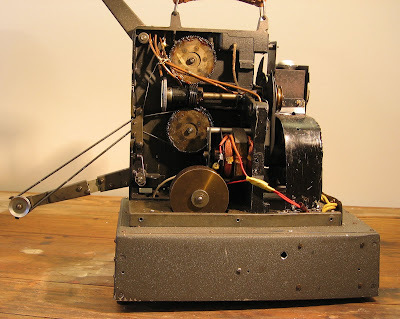 A journal of the restoration of a Pathé Marignan 9.5mm film projector. 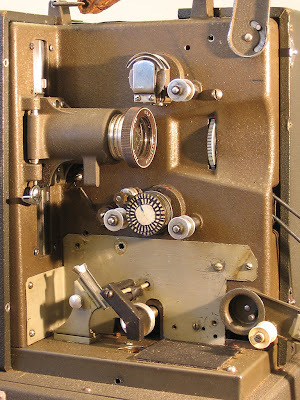 As can be seen from the photos in the previous post, the original Pathé Marignan projector was quite a compact unit. The outer case was made of plywood covered in a kind of grey bookcloth material. Most of the machine's workings are mounted on an L-shaped cast Aluminium chassis. This includes the drive motor, pulleys, shutter and claw mechanisms, and a drive shaft which connects to the feed and take-up sprockets. The cast Al chassis is in turn mounted on a simple folded steel base. The projector which I am refurbishing had been heavily modified in the 1950s by my father. The most obvious change to the appearance of the machine is the addition of a large folded aluminium box to the base of the machine. On closer inspection, this box turned out to be what was probably an old valve radio or amplifier chassis — there were signs of holes which had once contained valve sockets. A transformer for supplying 12 volts AC to an exciter lamp for optical sound. A condenser lens assembly which focussed the light from the exciter lamp onto the film soundtrack. 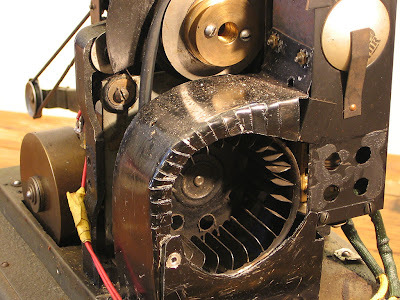 A cutaway to accommodate a large brass flywheel which stabilised the film motion as it went around the sound drum. An amplifier for the optical sound signal collected by the photoelectric cell. A wire-wound potentiometer for controlling motor speed. Switches for the motor, motor speed (16 or 24fps), lamp and amplifier. Sometime in the 1980s I had designed a new solid state optical sound system for this projector which used a phototransistor in place of the original PE cell and an op-amp for amplifying the signal to line level. This latter version of the optical sound system was the one in place when the projector came into my hands. The following photos show more detail of the machine prior to starting refurbishment. Click on any photo for a larger version. (Above) Here is another view of the projector. It has clearly suffered the wear and tear of time and significant modifications done in a rather rough manner. (Above) The original outer casing has also been modified — hacked into at various stages and then patched up again. The black plate on the rear covers a hole that once contained a moving coil meter. This was probably part of a magnetic sound system which the machine sported at one time. A second motor had been fitted for that purpose — perhaps because of excessive electrical interference generated by the brushed drive motor. The secondary motor sat atop the machine in the area cut away from the rear of the cover (and now filled with a steel grille). The two silver vents are also later additions. The four-pin socket in the rear of the base is the inlet socket for 100v power — actually an old 4-pin valve socket plug, completely obsolete these days. (Above) A closer look at the film path. The original grey crackle-finish paint work on the chassis had turned brown over the intervening 50 years. A home-made strobe disk mounted on the take up sprocket was used in the past for setting speed — there was once a small neon lamp which swung into position in front of this strobe disk. The neon flashed at 50Hz and could be used to accurately set the machine's speed to 16fps or 24fps. Note the sound drum and auxiliary film feeder at the bottom. 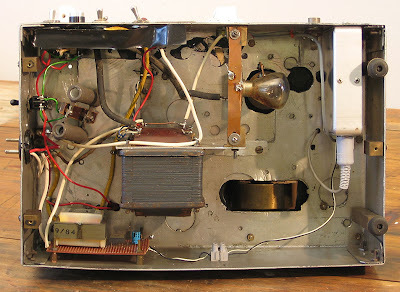 The little black device sitting in front of the sound drum holds the phototransistor for reading the soundtrack from the film. 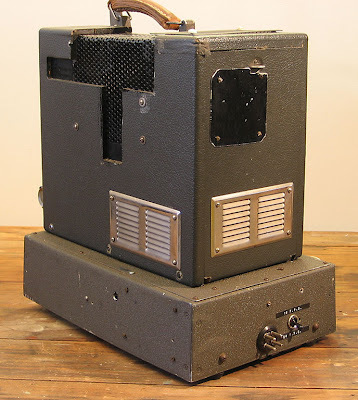 A piece of black cardboard covers holes in the base which originally accommodated a photoelectric cell, part of the 1950s optical sound additions. The exciter lamp and condenser lens are mounted in the large base unit and focus a slit of light upwards onto the optical film soundtrack. For the purposes of refurbishment, I intended to remove the optical sound system since preserving it would be too difficult and all of the home-made 9.5mm films in the collection are silent. (Above) By the time so many modifications had been made to the projector in the 1950s and later, the control panel was somewhat of a mess as you can see. (Above) Underneath the machine we see the contents of the aluminium chassis added by my father in the 1950s. It was added to support optical sound. You can see the 12v car headlamp used as an exciter lamp. The transformer supplies 12v for the exciter lamp. The power supply at lower left supplies abut 12v DC for the solid-state preamp which is in the diecast box at top right. You can see the flywheel for the sound drum poking through at lower right. The wiring was a real rats nest. This entire base will be replaced by a new smaller base with new electronics for motor speed control, new switches and new controls. (Above) Taking off the outer cover we can see the drive mechanism. Dating from the early 1950s, this French designed and manufactured machine is solidly engineered. The copper tubes at the top were an addition by my father — a lubrication system which had become disconnected. It needs to be removed. The original Pathé design includes a simple lubrication system which we will restore. The mechanism is still in good working order, just very dirty with a 50-year pile up of grease and dirt. It all needs a good clean and a reassemble. (Above) Finally a close up of the fan and cowl, the latter being added by my father in the 1950s. I don't know what was originally in place of this. From the photos of the Pathé Marignan for sale on eBay, it appears that the case may have contained space for stowing a power cord. Anyway, we will need to keep this cowl for the time being. The belt drive from the motor shaft onto the main drive shaft, on which is mounted the shutter, can be seen in this photo. The drive belt is quite loose. Is it the original one? I don't know. This one looks very much like an O-ring! I suspect a slightly tighter drive belt will be required. This is a great write-up, I'm currently trying to convert an old 16mm projector so that I can transfer my 16mm film collection to the computer. Silicon Chip has a new projector speed controller in the April 2011 issue, and I'm hoping to be as successful as you were. Thanks for all the tips. Paul Howson has worked in graphic design, website design and computer programming for many years. He trained originally in electrical engineering at Monash University in Melbourne. Nowadays he lives in rural Queensland in Warwick (pop approx 12500). Growing up in a family involved in film, television and theatre, Paul has always been interested in the technologies associated with these activities. 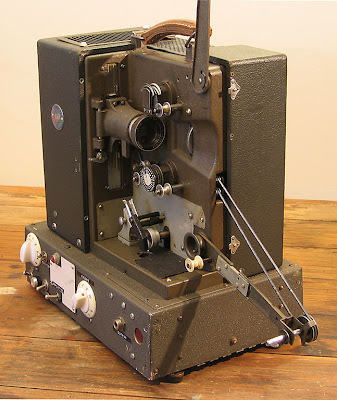 This blog details a project he undertook in 2009 to rebuild an old Pathé Marignon 9.5mm film projector which had belonged to his father, Denzil Howson.